Craft Stamping Quartet: Big Reveal Number one! Well, it's time to reveal my February project to you! For my envelope, I used a scrapbook paper called 'Gypsy Lace' by Bo Bunny. This is a gorgeous, deep turquoise colour with a cream lace pattern on one side, and has a distressed effect on the other side.On the upper inside edge of the envelope, I used Boken China Distress Ink to distress the edge, and a stempleglede grunge stamp to stamp around the edge of the paper. I made my own beaded trim using a mixture of beads in blues, greens and turquoises, which I attached to a piece of turquoise velvet ribbon, and sandwiched between a piece of cream lace, and cream ribbon. I wanted to fill my envelope with treasures and memories, so I used a Crafty Individuals frame, as Jean Hardy did in her project, and coloured this with Broken China and Scattered Straw Distress Ink. I then stamped a crackle stamp over the top, and added some fake silver leaf. I used a CI image with the word Dream down the side to echo one of my larger stamps. I then layered up a cream silk flower, a metal flower and a turquoise brad, and attached a little lock and key before fixing this to the frame. I made a letter fragment with a CI stamp which I placed behind a matted and layered Elusive Images sentiment. The layers were edged with the DIs and the stempleglede stamp as before. I stamped two Elusive Images butterflies and coloured these with Inktense pencils and a waterbrush. 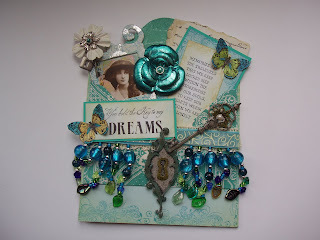 I used the 'Dreams' sentiment from the same Elusive Images themeplate as the key and lock that I stamped onto grungepaper. coloured these with pencils again, layered them up with silicone, and then coated them with Glossy Accents. 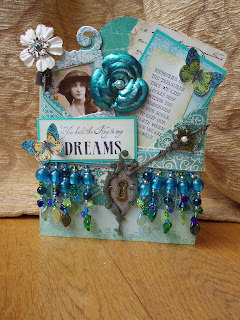 The pale turquoise Bazzil card that I used as backing card was again edged with DIs and the stempleglede stamp. My metal flower was explained in a previous post. Gorgeous colors and composition! Love the embellishments you used an how your layered them! Well, Judith, this is absolutely stunning. I love the colours, the beads, the butterflies and the way it all works together so beautifully. Utterly gorgeous! Judith - I am delighted to be the first to say well done on a brilliant project. Turquiouse is my favourite crafting colour, so I was bound to love what you have done and I am amazed at the number of techniques and treasures you have woven into this project - I am sure Jean would be proud of you!! Thanks to rising to my challenge with such skill and being the first to post your complete project, I love what you've done - I just hope I can finish my project with as much panache! Absolutely stunning, Judith, beautiful colours and composition, a piece to be proud of. Judith, this is absolutely stunning! I knew it would be when I first saw the items you were using and then your sneak peeks. As Elaine has said before me, Jean would be proud of the number of techniques you have managed to fit into what I know is a small area (Oh, I've really cheated on that score, Lol). I am in awe of your lock and key because I had a go at something similar for my OH Valentine's card and I know how difficult it is. Altogether a totally wonderful piece of work for the first completed project on our new blog. Ooops, just realised I have to follow this in a couple of days, Uh! Oh! What a beautiful and classy project, Judith. I really love the way you've used the lock and key stamps and the way you have included the little echoes of the 'dreams' and the lock and key. You have done us proud. After the promise shown in the sneaky peeks you have really delivered! Congratulations! This is absolutely scrummy - a beautiful project and the detail is wonderful. The colours are some of my favourites. Judith, this is amazing, there is so much detail to take in. I love the Bo Bunny paper, I'm totally in love with anything they bring out at the moment and that metal flower is just fantastic. Wow, I could look at this for ages. Absolutely gorgeous - I hope you have this displayed somewhere prominent! Well done! Breathtakingly gorgeous! Wonderful colours, wonderful everything! That is amazing and such a lot of detailed work - brilliant. I'm so looking forward to seeing the others too. This is STUNNING !! love the colours and details. My favourite colours, so I am bound to love this. Fantastic ammount of techniques, and beautifully put together. Very pretty. I love the colours and all the beads! Wow! ... what a lot of work! its gorgeous!